It's hard to walk anywhere in Puglia without bumping into an olive tree or tripping over a grape vine. The region's fertile plains, which stretch along the heel on the boot of Italy, are carpeted with more than 60 million olive trees and hundreds of vineyards that flourish under the baking sun. The resulting fruity olive oils and lusty red wines are much loved by locals, but it's a very special cheese that has become a must-have ingredient for London's top chefs. 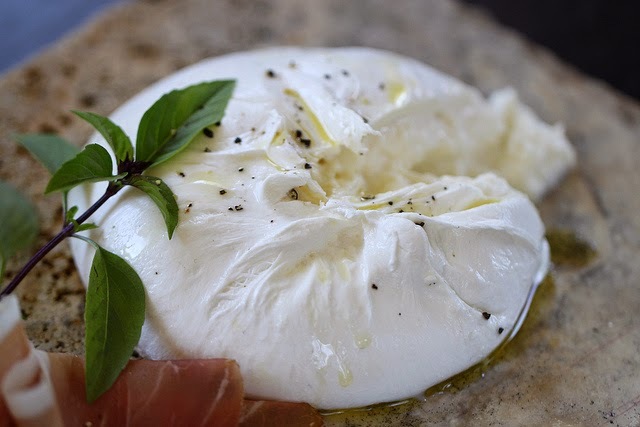 Sales of burrata – a rich, decadent cousin of mozzarella – have rocketed in the UK in recent years with the creamy 'formaggio' popping up on menus in everything from salads and risotto to pizzas and puddings. The outer shell of the cheese is made from cow's milk mozzarella, but cut into it and out oozes a gloriously rich filling called 'stracciatella', made from ribbons of mozzarella and a healthy dose of cream. Chefs in the UK love its fresh flavour and versatility so much that burrata is now threatening to overtake buffalo mozzarella as the Italian cheese of choice in the kitchen, says Fabio Antoniazzi of Italian food importer La Credenza, which supplies London's best restaurants and Harrods food hall. Like mozzarella, the cheese is best eaten young to fully appreciate its milky flavour and soft texture. In Puglia they serve it simply with crusty durum wheat bread, ripe tomatoes and a splash of olive oil, but the comforting creaminess of the cheese also makes it a perfect match for strong flavours. Chef Yotam Ottolenghi uses burrata in a dish with blood orange, coriander seeds and lavender oil at his Soho restaurant Nopi, while Jason Atherton serves it with quince, pear, truffled honey and pickled walnuts at Little Social in Mayfair. There are some terrific burrata recipes here. There's also a nice video by La Credenza's burrata supplier Maldera here showing how they make the cheese by stretching and kneading the curd, before shaping it into little pouches.